Back in January 2015 at CES, the fruits of the Martian and Guess partnership bore its first fruits with the announcement of the Guess Connect. A year or so on, and two new designs have been unveiled in Barcelona at MWC 2016. The two new Guess Connect watches are a female-friendly 41mm version with silver and sky blue touches, and a 45mm sporty black and white model aimed at men. Like the originals, which went on sale at the end of last year, the Guess branded smartwatches pack a Martian module inside, and have a microphone on board to pick up voice commands and dictation, allowing you to interact with smartphone assistants such as Siri or Google Voice using Bluetooth. You can even take calls on the watch if that takes your fancy. Bluetooth also syncs notifications, which are displayed on the OLED display but, unlike the Withings Activité range, or the Fossil Q Grant, there's no fitness tracking on board. We reviewed the Guess Connect back in November and were somewhat underwhelmed, stating: "The Connect falls down on a number of points: it's 3mm chunkier than an already chunky 'dumb' timepiece, it's double the price and more expensive than even the basic Apple Watch. The Bluetooth dropping out and problems receiving and dealing with alerts get annoying." Still, looks good though eh? 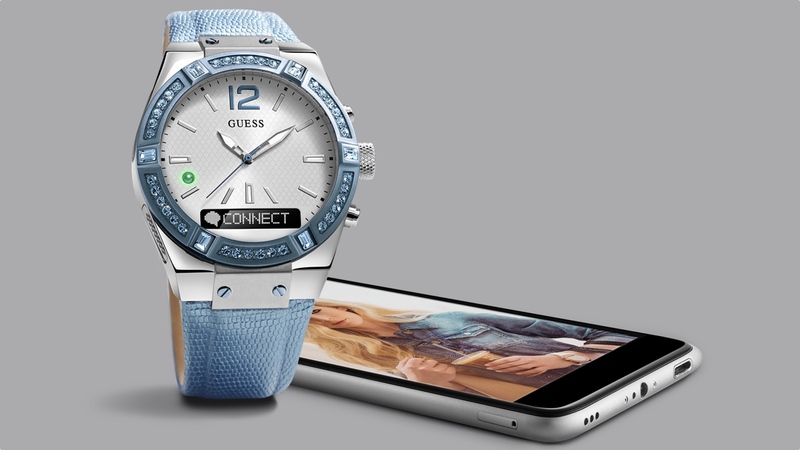 The new Guess Connect duo will be available in April 2016, with prices starting at $379. Be sure to bookmark our MWC 2016 hub to stay up to date with all the wearable tech news direct from the Barcelona expo.